Wohoo! 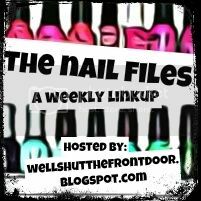 It's time for The Nail Files! If you've made the rounds at The Nail Files before, you know about Bailey and her freakishly amazing ability to get symmetrical dots (not that I'm jealous...okay, I'm totally jealous). I asked her what her secret was (it was practicing, which wasn't quite as magical an answer as I was expecting, haha) and after spending some time dotting a piece of paper, I decided that I was ready to give it a go. And you know what? Not only was I able to do symmetrical dots, but I did TWO DIFFERENT SIZES of symmetrical dots and all because I took my sweet time and did a whole bunch of practice dots right before. So although it takes way longer, practicing really did make them perfect (damn there being no easy way, am I right? Haha!). Link up and show off your pretty colour choices for the week! I need some fall inspiration! I really love this! And the colors are so sweet together. I need to practice the dang dot method, too! Whoohooo for practice rounds! Your dots look AWESOME! Thanks for zee shoutout - coincidentally you had one in my blog this morning too hehe! Very nice, like the colors and you did great on the dots! I like those colors together. I need to practice doing dots. Do you know where to get a dotting tool? These are PERFECT dots! Dot nails are my favorite kind of nails to do when I don't know what to do. I just wish they come out as neatly as yours. It sure is!! So it's already colored striping tape? So you just apply it? That's neat! Me too! A grey creme.. hmm..I just bought a really pretty one from my local drugstore it's by NYC color.. My all-time favorite grey is Sephora by OPI under my trenchcoat! I also like L'oreal's eiffel for you- it has a hint of lavender in the grey though. So Cute... the colors look amazing!